According to the United Nations, since the start of the Syrian civil war in 2011, some 400,000 Syrians have died, more than five million have become refugees, and over six million Syrians are now internally displaced. 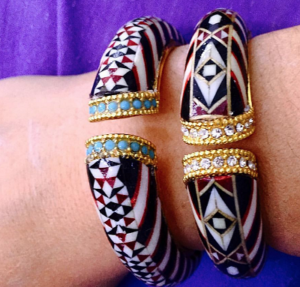 One woman – Rania Kinge, founder of social enterprise I LOVE Syria and Damascus Concepts – is making a difference in the lives of 130 (and growing) internally displaced Syrian refugee women, helping them earn a living by creating handmade jewelry and accessories that are sold worldwide. Gathered in what Kinge compares to “group therapy” sessions, the traumatized women surround themselves with healing colors of jewelry and accessories and enjoy a safe refuge while learning new skills. With assistance from the International Trade Center, an agency of the United Nations based in Geneva, the Japanese government, Oak Foundation as well as SOS Chretiens d’orient (who loaned her funds to create the first shows displaying her products at the UN headquarters in Geneva), Kinge showcased her handmade products to international audiences, reaffirming the importance of women economic empowerment. She has also been an invited guest at UNCTAD annual meetings to discuss the hardships and rewards of entrepreneurship in conflict zones. Working against all obstacles that face women entrepreneurs in a Muslim majority-developing country under a waging war, and harsh sanctions that curtail all normal resources, make life, nevermind running a business, practically impossible. Syria’s harsh cultural barriers concerning women’s independence and pay equity turn the “process of entrepreneurship to a dead-end with no eco-system of entrepreneurship,” Kinge explains. As a women entrepreneur she faces additional structural, cultural, and economical obstacles, compounded by total lack of trust that further stifles entrepreneurial idea leading to disempowerment. 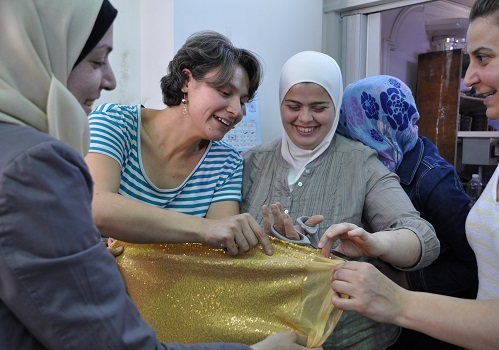 In-spite of such harsh circumstances, Kinge has forged ahead and replicated her first Damascus workshop, employing a handful of women to run additional workshops in nearby suburbs. Women are trained to earn wages that help ease the unimaginable hardships of life in an ancient, ten-thousand-year-old land that has been transformed into piles of ruins. Born in Syria into a family of diplomats, Kinge has lived in the U.S., Europe and through the Lebanese civil-war conflict. Following her parent’s divorce, she and her sister joined their mother in Switzerland where Kinge later earned a business degree and lived a lavish life as a computer specialist. While in New York City, at age 25, she was struck by the dazzle of Swarovski crystals and became hooked on jewelry design. 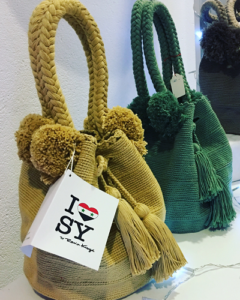 Later, she returned to Geneva, opened a boutique selling unique Syrian handmade items as well as her own jewelry designs, eventually leading her to work on improving the capacity and skills of the Syrian artisans from whom she was sourcing her products. One thing led to another and Kinge found herself living in Syria to oversee the process – and the social enterprise, I LOVE Syria, was born. The design of Kinge’s jewelry and accessories emanate youth, light, art, creation, colors and happiness– everything that can stand in purposeful, diametric opposition to the religious fanaticism, death and extremism that has pervaded her society. By empowering Syrian women (and their children), Kinge is saying to the world, “we’re still here”, and taking pride in preserving some of the ancient, rich Damascene artisanal arts like the Ishani mosaic design traditions. While refusing to watch Syria fall to pieces, marginalized and relegated to the realm of a third-world country, its women living on charity and its people eternal victims of war, Kinge is well aware that at any moment she, and the city, can be destroyed. Yet, despite plummeting morale, Kinge still hopes her “shoestring budget social enterprise” will continue to do good, create direly needed jobs, get noticed on the international arena in small ways and heighten the plight of the Syrian people by continuing to provide employment for her women artisans. Living in a constant state of war does put things into perspective and gives Kinge a new appreciation for friends and family and the importance of love, patience, forgiveness, and above all faith. “Everything is going to be OK, I have to believe this every day. Anything less would mean jumping on the first flight out of Syria,” shares Kinge who says she remains hopeful that the conflict will eventually draw to a close. Years of fighting against all obstacles as a woman entrepreneur, and the relentless bombardment of superpowers wrestling for territorial gains in Syria, has taken a visible toll on Ringe as the rest of the Syrian population. Yearning for a brighter future, she continues her risky journeys through Damascus neighborhoods to train more women in her workshops. And she remains focused on attaining financial assistance to help purchase a much-needed generator for her workshop and to expand her business so that she can employ more women. Amidst it all, the hope for peace ensues. Watch a video interview with Rania Kinge, read a more detailed interview about her life and thoughts, and see a gallery of her jewelry and accessory designs on Artists at War website. Jackie Abramian is an author, digital marketing professional, and founder of Artists at War multi-media platform offering interviews with artists living and working in warzones or in exile as a result of political and social conflicts. Reach out to her via jackie@artistsatwar.net Follow @ArtistsAtWar on Facebook – and when visiting the seacoast of New Hampshire or Maine – drop by her Haley Art Gallery (@HaleyArtGallery) and gift shop to purchase I LOVE Syria products.